1. In a large bowl, stir together flour, salt and yeast. 2. Add in oil and cold water. 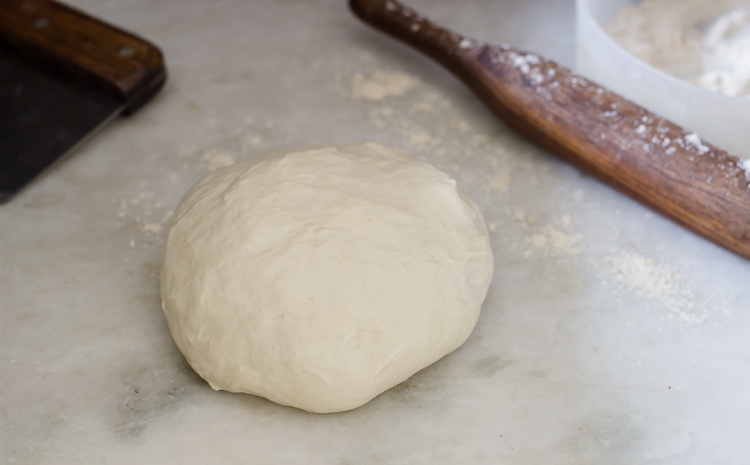 Using a metal spoon or your hand or a dough hook, bring together the dough till it forms a smooth and sticky dough. It should take about 5-7 minutes. The dough should clear the sides and stick to the bottom of the bowl. If the dough is too sticky and doesn't come off the sides of the bowl, then add in some flour to help release the sides. If it clears the bottom of the bowl, dribble in a teaspoon or two of cold water. The finished dough should be springy, elastic and sticky but not tacky. 3. Sprinkle flour on the counter and transfer the dough to it. Prepare a sheet pan by lining it with baking parchment paper and greasing it. 4. Using a metal scraper or sharp knife, divide the dough into 3 equal pieces. You can divide into 2 also if you are comfortable shaping bigger pizza. Dip the scraper or knife in cold water between cuts if the dough is sticking to it. 5. Sprinkle flour over the dough. Make sure your hands are dry and then flour them. Gently round each piece into a round ball. If the dough sticks to your hand, dip your hands in flour again. Transfer the dough balls to the sheet pan, mist them generously with oil and slip the sheet pan into a zip-lock bag. Put the pan into the refrigerator overnight to the rest the dough. You can keep it in refrigerator for upto 3 days. 6. At this point you can store these dough balls for future baking. After rounding each ball in above step, just coat them liberally with oil and transfer each ball in a separate freezer bag. Store in freezer for upto 3 months. Transfer the desired number of balls to the refrigerator the day before you plan to make pizza.